You have thought about this moment for a very long time. You have planned every little detail and every word you’ll say, picked carefully where and when it will take place and likely played it several times in your mind. You cannot stop imagining your loved one’s reaction when you finally ask the question that has kept you awake for so long! Organising a proposal can be stressful and will certainly be a moment forever engraved in your memory. Here at Celsteel, we know you want it to be perfect so in this blog, we are going to help you plan the perfect proposal by giving you tips on choosing the correct size for the perfect engagement ring without giving your intention to propose away! Make an imprint of the ring in blu-tac or trace around it on a piece of paper you can take this to your jeweller who can work out the ring size. You could also try it on one of your fingers and mark where it sits on your finger. The jeweller will be able to measure your finger at this point and work out the ring size. 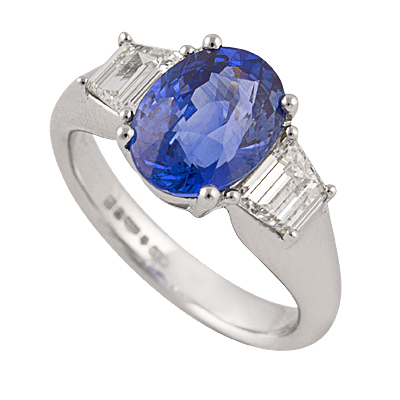 Look for a ring that has been forgotten about in a jewellery box or a drawer and take it to the jeweller. Make sure you do not borrow it for too long or it might look suspicious! A note of caution with this approach… Make sure the ring you are borrowing is worn on a ring finger. A thumb ring or even a middle finger ring will be bigger in size. Could you ask your partner’s sibling, friend or other family member to come up with an excuse to visit a jeweller? Can they pretend they need to buy a ring for a special occasion? It could be a graduation, a birthday or any other credible excuses you can think of. Ask them to encourage your partner to try on some rings and gather hints on your partner’s preferences in terms of style! Getting people to lie to your beloved isn’t something you we would generally endorse but we think that, for this occasion, you will all be forgiven! Place your hand next to his/hers and see if any of your fingers is of a similar size to their ring finger. This certainly isn’t the most accurate way of sizing for a ring but at least, it would give you an idea of what to go for when you finally buy this most important piece of jewellery! If your partner is a heavy sleeper, you could try to size their ring finger by wrapping a string or a strip of paper around their finger at night. Mark where the string or paper overlaps and take this to your jeweller. This approach is rather risky but if you decide to try this, make sure you have an excuse ready to explain what you are doing in case they wake up and you get caught red-handed! Alternatively, you can make sure you walk by a craft fair or a jewellery stall and start trying some rings. Encourage your other half to do the same. Put on the most outrageous designs to get them to join in or you could treat them to a spontaneous gift and ask them to pick a ring! Make a note of the size of the ring they try on and on which finger. If it is on the middle finger, we advise you to go down at least a size to work out their ring finger size. Tell your partner you want to choose a necklace and once in the shop, causally ask them to try a ring… perhaps not the most discreet but very effective! The average finger size for engagement ring in the UK is L – M for a woman and R – T for a man. If trying to find out your partner’s ring size is proving difficult, you could simply ask them. You might not get the surprised look on their face when you propose but at least, you will know for certain that the engagement ring will fit. Remember that the thicker/wider the ring, the tighter the fit, so you might need to go up a size depending on the design (especially for men’s rings which are generally thicker/wider). The ring finger on the dominant side is generally half a size larger. Take this into account when trying to size their engagement ring. If you’re unsure whether your ring size estimate is accurate, pick a design that can be resized easily. Discuss this with your jeweller during the design process. As a general rule, rings which have lots of little diamonds around the band are more difficult to resize as you have to be careful not to interfere with the settings of these little stones. If you are hesitating between two sizes, pick the smaller one. It is much easier to resize a ring that is too small than one that is too large. And more importantly, remember that this is not a test of your love or a reflection on your ability as a future spouse! Even if the ring doesn’t fit, you will have created a moment that will be in your mind forever and that hopefully will be the beginning of a wonderful future!